Oca are like a lighter, sharper-tasting version of the potato. Guy grows them on our French farm with great results: planted in March, they grow steadily through the summer before swelling into edible tubers in late autumn. They are Peruvian in origin, but are commonly known as New Zealand yams, and are used much like potatoes in both countries. 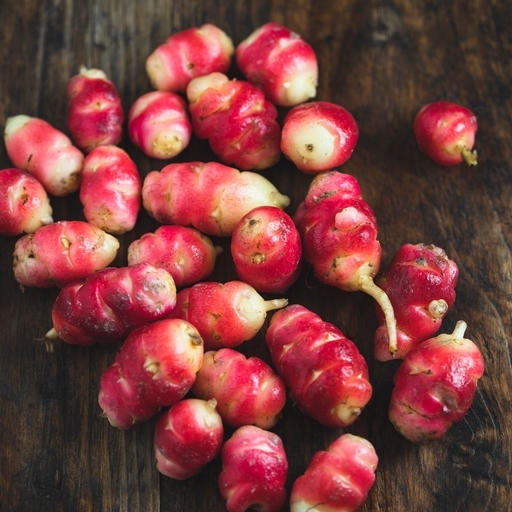 Oca can be eaten raw or cooked, and are characterised by a distinct lemony taste that lessens with cooking. Tangy and crunchy when eaten raw in salad, oca can also be roasted, stir-fried, boiled, braised or steamed to delicate softness. Riverford cook Bob thinks they’re at their best when just lightly cooked – simply chop into 2cm pieces and sauté in a pan with a little oil and salt for 10 mins. Alternatively, roast in a hot oven for 20 mins with a little oil and salt – cooked like this they aren’t a world away from a roast spud, it’s just as if a slight shake of vinegar has been added. Store in the fridge; will keep well for over a week.